Our 20 foot high Bismarck has endured a 4° list due to hurricane Irma. As this tree grows higher and heavier will this be a problem? 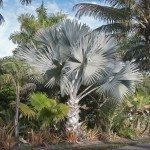 Ultimately it may end up with severe damage to the palm, but there are a few things to do to help it out. Potassium silicate will help to strengthen up the trunk quite a bit, but I recommend using it at half strength. Funny things start to happen when you use most silica products at full strength, depending on the plant. It affects the pH of the soil zone, which will lead to a potassium deficiency. These free silica will attach to as many potassium as it can. To counteract this, you may use iron sulfate to lower the pH swing.